How Does Time Work in Time Travel? What Is Fixed Time Theory? What Is Parallel Dimension Theory? What Is Divergent Dimension Theory? What Is a Temporal Anomaly or Paradox? What Is a Predestination Paradox? What Is a Grandfather Paradox? Shortly after I arrived at The Examiner, they put out a general call for a project called "101", to have writers create a series of articles explaining the basics of their various fields. This was originally sketched as a fourteen-part series and expanded to nineteen parts before it was completed. Although there are undoubtedly some parts that are a bit repetitive and there might be some coherence and flow problems, I decided to combine them all into one article; the original titles are listed in the Quick Jumps to the right, the articles reproduced as internally linked sections of the page. The series was followed by several reader questions (it may be that some of them were asked and possibly answered before the series was complete) which will appear in another page, and a couple years later much of it was expanded and updated with Theory 102, which will also find its way here eventually. In the worlds of time travel stories there are a few major theories which are used to make sense of how time would work if anyone, or anything, could experience it out of sequence--most particularly, if it were possible to travel to the past, what would happen? Could you kill your own grandfather? Could you become your own grandfather? Answers to questions like these are based on a theory of time. Anyone who has seen a few time travel movies should realize that they do not always follow the same rules. In general, most time travel stories wind up breaking even their own rules at some point. However, theoreticians have attempted to define how time works, and how that would impact what happens if someone were to travel to the past; sometimes even characters within the stories have such debates. There are three major theories, with a few variations. In nearly all cases, the very concept that it is possible to travel in time demands that the past and the future in some sense exist; that is, traveling to the past is like traveling to another place. It is as if all of history were a book already written, or a movie already completed, and we are in a particular part of that story; but the story behind us is still there, a few pages or frames back, and the story ahead of us is already awaiting our arrival. This concept that all of time exists as if it were space is fundamental for any notion that someone could travel to it. However, the sense in which it exists may differ according to the theory of time, and in some theories the future does not exist, in some cases such that even if you came from it you cannot return to it. Perhaps the leading theory is called Fixed Time Theory. According to this conception, the past is already established, and nothing in it can be changed. Starkly distinct from it is Parallel Dimension Theory, which maintains that a traveler going to "the past" lands in a different universe. In pure parallel dimension theory, this universe has always existed alongside our own, and has had a history identical to our own until the time traveler disrupts it. There is a variant version, Divergent Dimension Theory, in which the new universe is created by the arrival of the time traveler, whose presence changes history for that new universe but has no impact on the world from which he departed. The third major theory, followed to some degree by many time travel stories, is Replacement Theory, which holds that a traveler to the past will change history, erasing what was and creating a new timeline. Variants of this theory mostly diverge based on their rules regarding what happens if history is changed in certain ways. These major theories will be examined in more detail individually in future articles. There are other theories, and partial theories, attempting to resolve what might happen if someone were to travel through time. Efforts to provide a framework for popular time travel stories have led to the investigation of the possibility of Two-Dimensional Time, in which history exists from beginning to end, but time travel causes it to change "all at once", creating an entirely new independent history of the world in which some elements from the previous history might be retained despite having no source or cause in the new world. The concept of Supertime has been proposed as a means of rectifying changes in history that break causality. These theories attempt to create the possibility that a time traveler could unmake the history from which he came and yet still exist in what he perceives as the past of the new history he has made. Concepts such as these sometimes seem to be behind particular time travel stories, such as Poul Anderson's Time Patrol series, but it is difficult to derive a consistent theory of time from most such stories. There are also stories which challenge the notion that the past is still there. Stephen King's The Langoliers appears to be suggesting that people live only in the present, racing forward from second to second to keep ahead of the creatures who devour the world of a few minutes ago. Under such a concept of time, time travel would be impossible, and anyone who succeeded in stepping out of the present moment would find nothing, no one, and possibly nowhere. In the world of time travel fixed time is one of the most popular theories mentioned in the effort to make sense of how time would work if anyone, or anything, could experience it out of sequence. This may be marginally the most popular theory of time among scientists. According to it, you cannot change the past--not merely because, as the library computer in The Time Machine suggests, you cannot go to the past, but because the past is immutable. Thus even if it were possible to travel to the past, you could not change anything. Could not change anything does not mean, as suggested in the aforementioned movie, that Emma who died at the hand of a mugger will die somehow within a few hours of the same time and a few miles of the same place; it means that Emma will die in exactly that way, at the same time and place, by the hand of that same mugger, as she already died. If you were able to travel to the past, you would find that whatever part you played in events was the part you had already played in those events, leading to exactly the same outcome. Once you step into your own past, you are fated to do whatever you already did. Concerning whether you can kill your own grandfather, a fixed time theorist will reply that you have already failed to do so, so your attempt will fail--or more precisely, your attempt has already failed. This is seen by some as a failure of the theory. It is also inherent in fixed time that the future is equally determined. It is, after all, the past for any point in the yet further future. As mentioned, the very concept that you can travel to the past or the future means that all of history already exists, like a movie in which we are characters moving through the frames but someone outside the film can choose what scenes to watch next. It is thus inherent to the theory that choice is an illusion and future is fated. Time is not a medium within which the world forms and changes, but a path along which we move to experience what already is. Many fixed time stories play on this theme. Fixed time also holds that events can form a causal loop, sometimes called a predestination paradox, in which causes in the future bring about consequences in the past which in turn are the causes of the events in the future which caused them. This uncaused cause is another significant source of objection to the theory, but those fixed time theorists who allow these (and not all do) assert that these are entirely possible, as long as they are self-supporting. Although it is not always possible to ascertain the theory behind a film, films which might be built on a fixed time theory include 12 Monkeys (in which James Cole has seen his own death but cannot avoid it), Kate and Leopold (in which Kate was already her boyfriend's ancestor, and was in pictures from the party before she traveled back to the party), Happy Accidents (in which a great deal of the story is about whether it is possible, based on some rule related to a focus of emotion on a specific moment, to change history), and The Final Countdown (in which the designer of the ship is the man who was left behind when it returned from the past). None of these are perfect examples under the theory, as each has aspects that do not fit it, and most can be explained to some degree under different theories. Although we noted that fixed time theory seems to be preferred by scientists, not all believe that time travel is governed by it. Quite a few hold that there are parallel dimensions, our universe duplicated outside our perception, and that a time traveler would land in a parallel universe. There are two distinct notions about these parallel universes, one, that they are all identical unless a time travel event interferes, and the other, that they are all different due to random events altering history, compounding over time. This latter version is the basis of Sliders, the television series in which a student and his friends cross the Einstein-Rosen Bridge into parallel universes and cannot return home. In this version of parallel universes, the world in which you arrive probably would be not merely different but very different; we would not call such an event time travel. This remains an objection to all versions of Parallel Dimension theory: no matter how similar two universes are, they are not the same universe, so this is not really time travel. Travel to a parallel universe, whether identical or distinct, is often referred to as sideways time, a term that has different meanings under other theories. Even if all universes initially are identical, time travel changes them, causing them to diverge from each other. It might be thought that given an infinite number of universes this would not matter, because if a time traveler changed only one of those universes so as to prevent his departure from it, the next time traveler probably would not land in the same one. However, since those infinitely duplicated universes are all identical unless altered by the acts of a time traveler, then "half an infinite number" (also an infinite number) of time travelers have departed from "half an infinite number" of universes and prevented their own departures from the other "half an infinite number" of universes, and thereafter any time traveler has only a fifty-fifty chance of landing in an unaltered one--a chance that decreases with each additional trip made by anyone. People think that making the number of universes "infinite" solves these problems, but it only makes them more difficult to discuss. It is also implausible, as although our universe is vast we have found no part of it that is infinite. The existence of the future in such systems varies with the version. In one, there are an infinite number of such universes in a continuum such that moving sideways across them is like traveling through time: a distance of one minute sideways places the traveler one minute to the seeming future or past. In such a version, the current existence of a linear past or future is irrelevant. History might be being created instant by instant and falling into non-existence as it passes, or it might exist in full form from eternity to eternity in each timeline. Also in such a world, if you traveled to the past and changed history, then came forward to the present, you would have moved to another universe and back, so nothing you changed would be different in your own universe. This prevents paradoxes, as you are not affecting your own past: you can enter the past of another universe, but no one from that universe could ever enter the past of yours, which is positioned to its future. Without this or similar limitation, parallel dimension theory does not avoid paradox: if a traveler from world one alters the past of world two such that a traveler from world two alters the past of world one, the fact that they are distinct worlds is no longer relevant, as the causal chain now connects them: the change in each world is dependent upon the change in the other. Other versions of parallel dimension theory differ in whether the future exists in the present universe or not. This often reveals itself by whether the traveler to the future arrives in the same universe or another, since to travel to the future the future must already exist. However, parallel universe theory remains popular among theoreticians, partly because there is scientific evidence suggesting the existence of parallel dimensions. It is not conclusive that these exist, nor whether they are like ours, but if so they would enable something like paradox-free time travel allowing the traveler to change history. Although varied parallel dimensions have been considered in the context of other time travel venues such as Dr. Who and Star Trek (which will be discussed in connection with sideways time), it is rare for identical dimensions to substitute for time travel in stories. Although pure parallel dimension theory rarely appears in time travel stories, its offspring, divergent dimension theory, is more common. It is used in fiction to avoid paradox. The salvation of this theory is also its problem: each trip creates a new universe diverging from the previous one. Although this faces most of the objections to parallel dimension theory, it avoids one: travelers never go to the same universe, but to one that did not exist prior to their arrival. Universe creation is a problem for physicists: this must create a universe as large as our own, but conservation of matter and energy declares this impossible, as it would require the energy in all matter and energy in this universe. However, in most stories the mechanics of time travel are secondary to those of the effects, and this theory manages effects well. The theory's strength derives from the facts that the traveler is not impacting his own history but that of another world exactly like his own. This prevents paradox while giving the illusion of time travel and allowing free action. However, the traveler never changes his own history, but that of someone who would have become him had he not interfered. Returning to the future, he finds there is another version of him there who has a better claim to his identity. Some fiction, such as the role playing game Multiverser, suggests that the universe is constantly dividing at every point where anyone makes a choice or anything could happen or not, dividing into one universe for each event that could have happened. If you could go somewhere or stay home, there must be one universe in which you go and another in which you stay. The number of universes so created is staggering. There are at this moment hundreds of things you could do--go to bed, eat, read this page, read another page, rob a bank, assault the person in the next room. You are doing one. Multiplying the number of universes by the things you could do, even that meager list makes six universes. A second person with six choices makes the number of universes thirty-six; a third makes it two hundred sixteen--increasing exponentially with each additional person. The population of Earth is billions, with innumerable choices for each, recurring each second (or less) (because you could change what you are doing now, or now, or now). Thus the number of universes expands at an inconceivable rate. More challenging, though, is there are at least as many wicked terrible harmful selfish things anyone could do as good wonderful helpful selfless things, but the theory multiplies by one universe for each thing. Nearly everyone alive could have assaulted someone several times today, but most did not. This theory means there must be many universes in which most people did assault someone today, and tomorrow ours might be such a universe. All possible universes existing, ours is extremely unlikely, and almost certain to turn toward the barbaric tomorrow; yet it never does. This seems fatal to such a multiverse theory, which makes for fun fiction but does not fit reality. Sideways time sometimes applies to divergent dimension theory much as it does to parallel dimension theory, but it is more common in divergent dimension stories to assert that such travel is impossible. Divergent dimension theory then resembles replacement theory, in that the universe that was is inaccessible to those who left it. It is sometimes unclear in stories whether the original history has been replaced or the travelers have been isolated from it. Travel to the future under this theory is more confused. In most versions, such travel takes the traveler to the future of the world he created; however, in some versions any travel through time creates a new dimension, and in others a traveler will return to his own universe if he travels forward the same temporal distance that he traveled back. The mechanism for this is unclear, failing to answer what happens if the traveler heads for a time in the future of his place in the past but the past of his originating point in the future. Divergent dimension theory is found in Back to the Future Part II, and something like it may have been behind Donnie Darko and Primer. Under replacement theory, it is assumed that no one can arrive in the past before he departs from the future, in a sequential sense; and that this sequential sequence is tied in the original history to temporal sequence. This means that there is always an original history, a version of events in which no one and nothing arrives from the future because the future has not yet been reached. The time traveler departing from the future then arrives in the past and alters that original history, in essence erasing it and replacing it with a new version. In so doing, he also undoes his own existence in the original history, and so at the moment that his departure time is reached he undoes that departure; this in turn undoes his arrival in the past--unless the version of himself in this altered history makes that same trip to the past, and so becomes the cause of his own arrival. The theory is frequently highly rigorous, following strict rules related to maintaining causality. That is, it is certainly possible to travel to the past and kill Adolph Hitler, but you must be careful to ensure that you do not also prevent yourself from making that trip, because as easily as you can undo Hitler's legacy of horror you can also undo your own existence. Under rigorous versions of replacement theory, once you have undone your own departure to the past you have also undone whatever changes you made in the past, including the fact that you changed your own history. Time thus becomes caught in an infinity loop, something akin to a Mobius strip in time, alternating between two versions of history. Other possible anomalies under replacement theory include the sawtooth snap, cycling causality, and N-jump, each of which will be examined in detail below, illumining the theory concepts further. Some less rigorous versions of the theory tend to gloss over the problem of the impact a trip has on the traveler himself. That is, once the traveler has made changes he might undo his own birth, but he does not undo his own arrival in the past. These logical inconsistencies are answered by falling back on the notion that once the past has been formed it can only be changed by someone coming from the future, and so what the traveler did in the past cannot be undone except by someone traveling from the future. In short, the only event you cannot prevent is the arrival in the past of a time traveler, even if you successfully prevent his departure from the future. Such versions of the theory begin more to resemble divergent dimension theory, in that the traveler comes from another branch of time which still exists without him; he has changed history, but has not actually changed his history. The long list of movies in which replacement theory of some form seems to be in view includes Back to the Future and Back to the Future Part III, the several Terminator movies, Millennium, Flight of the Navigator, Frequency, and probably Star Trek IV: The Voyage Home. Many stories which appear to work under fixed time theory and some which appear to work under parallel or divergent dimension theory work as well under replacement theory. This web site relies on this theory in its analyses of many familiar and lesser-known films, and is an excellent source for information concerning this theory. In time travel, a paradox is any combination of events caused by a time travel event which is counter-intuitive and appears on some level to be impossible. The term temporal anomaly was coined to refer to any disruption in the normal flow of time or of the sequencing of events within time. It thus includes paradoxes, but is a considerably broader term, referring to any event in which persons, objects, or information travel through time in a way that disrupts time. There is disagreement as to whether time travel to the future creates an anomaly or not. Some maintain that travel to the future is not different from the same object or traveler being dormant or inactive for the period of time skipped, except that it does not age. Others observe that the total mass of the universe must decrease during that time, and then increase at the arrival point, and that this coupled with the aspect of the object not aging is sufficient to categorize this as an anomaly. Further, under some forms of parallel and divergent dimension theory, the traveler to the future leaves his own universe and enters another even in forward time travel, and thus an anomaly is created similar to time travel to the past. Other forms of these theories maintain that travel to the future does not entail a move to another dimension, although travel to the past always does. No one has attached a name to such an anomaly, and it does not threaten to create a paradox under any theory of time. It should be noted, however, that a return trip to the point of origin (or any point in the past of the traveler's temporal position) does create an anomaly, as any other time travel to the past would. 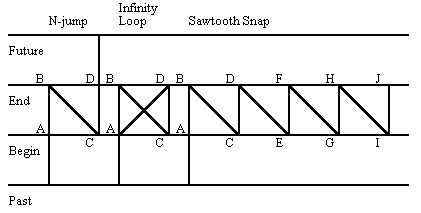 Under replacement theory there are three major types of anomalies, the infinity loop, the sawtooth snap, and the N-jump. These names are based on diagrams (reproduced to the right) which first appeared in Multiverser: The Game: Referee's Rules. An infinity loop describes usually two distinct histories which cause each other. A sawtooth snap refers to an unstable progression of histories each causing the next in sequence. An N-jump refers to any time travel event in which the changes to history are minimal enough that time stabilizes into a unified sequence of causes and effects. The term cycling causality is sometimes used for anomalies like infinity loops and sawtooth snaps, but its use is not consistent. Other anomalies include the predestination paradox or uncaused cause, in which a chain of events is self-sustaining because events in the future are necessary causes for events in the past which in turn are necessary causes for those same future events; and the two grandfather paradoxes in which events in the future interfere with necessary events in the past. Temporal doppelgangers also occur, which may also be called temporal duplicates, parallel or divergent selves, or former and future selves, depending on how they are related to the traveler under the presumed theory of time. Each of these anomalies is considered below. In discussing temporal anomalies caused by time travel, the infinity loop garners the most attention of all those occurring under replacement theory. This decribes any scenario in which actions in one history cause a second history, but actions in the second history cause the first. It has been called a bow tie loop, or a Mobius time loop; sometimes the term cycling causality is used for anomalies similar to infinity loops, but the use of that term is not consistent, and will be discussed in our next article. A simple example of an infinity loop is a case in which a time traveler attempts to prove that he is a time traveler by telling someone, "I know what you are going to have for lunch," and then reporting what he remembered from his own history, only to have the person "prove him wrong" by having something else. Thus in one history, the skeptic has a hamburger, and in the second history the traveler tells him he is going to have a hamburger, so the skeptic decides instead to have pizza in the second history; but this changes the information available to the traveler who now tells the skeptic in the third history that he will have pizza, and the skeptic instead has the hamburger he originally preferred. Since having the hamburger in one timeline will cause him to have the pizza in the next, and having the pizza in that timeline will cause him to have the hamburger in the next, history is forever trapped between these two timelines. According to strict replacement theory, when this occurs time itself becomes trapped, and cannot progress to the next day, because the causal chain requires that the skeptic have eaten either the hamburger or the pizza, and it is impossible for either to be the final answer. Thus this is the end of time, because there can be no history beyond that point. The theory also holds that an infinity loop occurs if a time traveler somehow prevents his own trip to the past, such as by "fixing" what he wanted to fix. Supposing that the time traveler wished to kill Stalin before the man came to power, and in traveling to the past managed to do so, his counterpart born in the world in which Stalin never came to power will have no reason to make that trip. Yet if he never leaves from the future, he never arrives in the past, and so never kills Stalin. Fixed time theory resolves this by saying that it is impossible: you cannot kill Stalin because it is established that he survived, and thus that you already failed. Parallel and divergent dimension theories resolve the problem by saying that you did kill Stalin, not in your own world but in another universe indistinguishable from your own world. In essence, the past you changed was someone else's past, someone who never knew that Stalin mattered, and since you came from a different universe, the fact that your counterpart never makes that trip does not alter the fact that you arrived. Thus the infinity loop is connected strictly to replacement theory. This aspect of time reverting to its original form because of the failure of the traveler to depart from the future raises the strongest objections to replacement theory. Efforts to resolve it in a manner in which the traveler's failure to depart does not undo his arrival have led to such theories as two-dimensional time and supertime. Yet under strict replacement theory, the outcome is unavoidable based on causal chains, that if the cause is removed, the effect is removed in sequence, regardless of the temporal relationship. What Is a Sawtooth Snap or Cycling Causality? The term sawtooth snap has been coined in connection with the replacement theory of time. It describes any temporal anomaly in which more than two histories cause each other in sequence, such that each causes the next. For a simple case of a sawtooth snap, imagine that on Friday morning an experimenter checks his strongbox and finds it empty, then that night uses a time machine to send one hundred dollars back in time to appear in that box that morning. In the revised history, on Friday morning he checks the box, finds and removes the money, spends one dollar on a soda, and that night sends the rest back to Friday morning. On each successive replay of that Friday the experimenter removes the money from the box, spends a dollar, and sends the remainder back to that morning. Thus each morning after the first the experimenter will find less money in the box, because each evening he sends less back. The history of the world changes incrementally with each iteration, by a decrease of one dollar in the box. Sawtooth snaps technically have three distinct forms, distinguished by their terminations. In the example above, eventually there will be a single dollar in the box, which the experimenter will spend on soda, and then he will send no money to the past; his counterpart that morning will find an empty box and will assume that the experiment has not yet begun, so that night he will send one hundred dollars to the past, restarting the sequence. This is called an infinity loop termination, because it is like an infinity loop but that it involves multiple timelines in its progression. It is possible for a sawtooth snap to resolve to an N-jump (to be discussed next), a self-supporting single history in which the last timeline causes itself and time continues based on that final history. It is also theoretically possible for a sawtooth snap to continue in a non-repeating causal chain, such that the end of each timeline initiates a unique new timeline (akin to the decimal string on an irrational number). The term Cycling Causality has also been used to describe any anomaly that resembles a sawtooth snap, but particularly those which have infinity loop terminations, in which a string of several ("2 to n") distinct histories cause each other in a repeating sequence. It is thus commonly connected to sawtooth snaps, but is a distinct term in that it includes simple infinity loops but excludes perpetual sawtooth snaps (which never repeat a duplicate history) and those which resolve to an N-jump termination. The use of this term is not consistent, though, sometimes being used to describe any sawtooth snap. Many movies are best explained as sawtooth snaps, including the first two Terminator films. Of those temporal anomalies recognized under the replacement theory, the N-jump is the good outcome, the temporal event that allows history to continue. What identifies an N-jump is that all causes of all effects are found in a single timeline. In this, the final history in an N-jump is indistinguishable from fixed time; the difference is how it is achieved. Under replacement theory, it is assumed that no one can arrive in the past before he departs from the future, in a sequential sense; and that this sequential sequence is tied in the original history to temporal sequence. Thus there is always an original history in which no time traveler ever arrived from the future. To understand this, assume that in 2000 our traveler is ten years old, and that later in 2020 when he is thirty years old he travels back to 2000. In the sequence of events in his own life, the thirty year old version of him that arrives in 2000 must have been twenty-nine in 2019 before he left for the past. Yet if he has not yet left for the past, he cannot be living in a world in which he already arrived in the past. Thus there is an original history in which traveler grew from ten to thirty years old, and then at thirty years old traveled back to when he was ten, changing the history of the world at the very least by virtue of his own arrival within it. There is then a new history of the world in which the young traveler ages from ten to thirty, unless his older self does something which interferes with that. Since the time traveler has erased the original history and created a new version, it is logical that he has also erased his own history and thus his own existence. Since, however, his presence in the past is dependent on his departure from the future, he will vanish from the past--unless something is done which will preserve his existence in the past. An N-jump means that whatever the time traveler does in the past leads ultimately to his unaltered identical younger self making the same trip to the past, and so doing the same things. This confirms the altered history as the stable history of the world, since at the end point of the anomaly the "same person" will make the "same trip" to the "same time and place" and do the "same things". If the traveler's duplicate self fails to confirm his actions in the past, the result will be that history has to repeat itself until it is stable. If the failure is major, such as that the traveler does not make the trip at all, this will create an infinity loop; a lesser failure may result in a sawtooth snap of some form, delaying the resolution for some uncertain number of repetitions of history. Elaborate schemes have been devised by which a time traveler could change the past but ensure that he does not undo the information which led to his actions. Some of these involve temporal protections which isolate some person or group from the impact of such changes, but the better methods rely on delivering accurate information concerning the original history to the people responsible to oversee it. Ultimately, unless the author intends to create a temporal disaster, the N-jump is the desired outcome of all time travel stories. It is the only outcome of time travel which allows a future under replacement theory. Time travel and parallel dimension stories sometimes speak of sideways time. The term is used to describe different concepts under different theories of time. It is most commonly heard in connection with parallel dimension theory, in which there are presumed to be a vast and possibly infinite number of parallel worlds alongside our own. In some versions of the theory, these universes are all different, frequently very different, as their histories have diverged based on random variations in events over time; thus stories built on this concept are less about time travel and more about universes that are similar but distinct. The 1970 Dr. Who episode Inferno with Jon Pertwee is such a story, as is the original Star Trek series episode Mirror, Mirror and its Deep Space Nine sequel Crossover, and all the episodes of the series Sliders. In these contexts, sideways time means moving to a universe which has always existed as a distinct universe, that is similar to but divergent from a "home" universe. In a purer version of parallel dimension theory, sideways time still indicates traveling to another universe, but that the other universe is identical to the "home" world. In some versions of the theory, these universes are offset incrementally, such that moving sideways across them gives the appearance of moving forward and backward in time, but that anything the time traveler does in one universe will change it without affecting any other. The problems with this concept are myriad, most notably that a single time travel event will disrupt the parallelism of an infinite number of universes, making all future sideways time travel unlike time travel because the parallel universes have all been put out of synchronization with each other. The concept of sideways time is sometimes mentioned in connection with divergent dimension theory as a means of getting from the present universe to the lost original universe, although in most cases, such as in Back to the Future Part II, it is discounted as an impossibility. The original universe still exists in divergent dimension theory, but its integrity (the prevention of paradox within it) demands that it be unreachable from any diverging universe. Were it possible for someone in a divergent universe to return to his universe of origin at any point prior to his departure from that universe, he would have to create yet another divergent universe or all the advantages of the theory would be lost (paradox would not be prevented). Illustrations of anomalies in replacement theory sometimes are perceived as suggesting the possibility of sideways travel to a previous version of history; however, under replacement theory the previous version of history is being erased as the new version is created, and thus there is never a corresponding "now" between the two histories. Under fixed time theory the concept is irrelevant: there may be parallel dimensions, but traveling to them is unlike time travel in any way and should not be confused with time travel. The theory of two-dimensional time treats sideways time differently. In this case, time exists in complete form from beginning to end (or from infinite past to infinite future), but this complete history of the world can be changed by movement akin to sideways time, typically by the movement of time travelers to points in their pasts. The theory is that the arrival of a time traveler in his own past changes all of history from that moment forward, and so the universe shifts to a new timeline. In such circumstances, the old timeline becomes inaccessible, but objects and persons already severed from their own origins by time travel may continue to exist in the new timeline. Also of interest in this is the concept of supertime, a construction that attempts to use something like sideways time to allow change to propagate through the history of a new universe at a delayed rate. Again under this theory the original universe might continue but is inaccessible; sideways time travel is in one direction only. A predestination paradox is a temporal anomaly which is said to be possible under fixed time theory. It is also known as a causal loop or uncaused cause. Fixed time maintains that the past and the future all exist already in static form, and that time is not more than our perception or experience of events within it. Thus for something to move from the future to the past is not different in kind from something moving from the living room to the bedroom; it is simply in a different position within four-dimensional space, and it happens that the value of the dimension we call time has moved in the direction in which it does not usually move. Since this is possible, it would also be possible for that object to initiate a chain of events which ultimately is the cause of its own motion from the future to the past. The billiard ball example is most commonly used to illustrate this. According to this example, a billiard ball goes into a pocket that is actually a wormhole transporting it to a moment in the past. It emerges from the wormhole and collides with itself, driving itself into the pocket through which it has just traveled. It is argued that since it is possible for the billiard ball to be knocked into the pocket by this collision, it is perfectly reasonable for this to be and always have been the history of the universe, that a billiard ball entered a wormhole because when it earlier emerged from that wormhole it collided with itself and knocked itself into that wormhole. Opponents of the theory call this the uncaused cause, stating that this is something that can only happen if it happens, and in that case it cannot happen. Other theories of time resolve these events very differently. Under parallel and divergent dimension theories, the billiard ball which enters the wormhole emerges in another universe. It then can collide with its temporal duplicate--the version of the billiard ball that is native to that universe--but that this collision will almost certainly prevent the ball from entering the wormhole. There are thereafter two billiard balls in that universe and none in the originating universe. Replacement theory offers a more complicated solution to the problem. It maintains that there must have been a now lost original cause: something else knocked the billiard ball into the wormhole, and then as it emerged from the wormhole it interfered with the original collision and replaced it with a new collision by which the billiard ball now knocks itself into the wormhole. Assuming the trajectory is consistent, the billiard ball can become the cause of its own trajectory. This is technically the umbrella paradox for one version of the two anomalies called the Grandfather Paradox, in which (in this case) a man becomes his own grandfather, or an object becomes the origin of its own existence. Although that is properly a subset of this anomaly, it will be discussed separately. There are actually two very different temporal anomalies that are referenced by the name Grandfather Paradox, one in which a time traveler kills his own grandfather and so undoes his own existence, and one in which he becomes his own grandfather by impregnating his grandmother to become his own progenitor. The latter of those was just mentioned as being properly a subset of the Predestination Paradox. It may seem at first glance that these are the same concept, but they are in significant ways diametrically opposite. Becoming your own grandfather involves a causal loop, in which a necessary cause of a present reality is dependent on that present reality as its own necessary cause. That is, if the time traveler does not travel to the past he will never become his father's father, and so he will never be born; but as long as he is born, he can become his own grandfather and so be the cause of his own existence. Killing your own grandfather is a disruption in which a necessary cause of a present reality is undone, but that that present reality is a necessary cause of its undoing. This is precisely opposite to the other. In this case, if the time traveler successfully kills his own grandfather, he undoes the necessary cause of his own existence and ceases to exist; but if he ceases to exist, he cannot travel to the past to kill his grandfather, and so his act of undoing his own existence is undone and he then exists to undo his own existence. Although the classic examples for which these paradoxes are named specifically involve an individual tampering with his own ancestry, both paradoxes can exist in similar forms but other contexts, including in relation to inanimate objects. The existence of the T-800 in the original Terminator movie is an example of the machine effectively becoming its own grandfather, as Cyberdyne designs Skynet based on copying technology from the parts crushed in its assembly line. In Deja Vu, Agent Doug Carlin prevents the murder of the girl whose murder investigation gives him the information he needs to identify the murderer and prevent her murder, effectively "killing his grandfather" by undoing the source of his knowledge. These paradoxes do not occur at all under the parallel or divergent dimension theories, because in these cases the grandfather you kill or grandmother you impregnate is not actually your own, but is the counterpart to that person in another universe. In that other universe, it does not matter whether you are ever born, or whether someone else is born instead of you, or no one is born at all when you would have been, because the existence of the person who has taken this action ("you") is completely independent of any event in the universe in which the action occurs. These paradoxes are usually presented in connection with fixed time stories, in which the latter (in which you become your own grandfather) is treated somewhat inconsistently as a legitimate expression of the predestination paradox, while the former is generally said to be impossible by theorists but still explored in fiction. These two distinct paradoxes require further consideration of their resolutions under fixed time and replacement theory. What Happens If I Become My Own Grandfather? In one of the two temporal anomalies that are called Grandfather Paradox, a time traveler impregnates his grandmother, becoming his father's father. This is a subtype of the Predistination Paradox, but that has three forms, represented by the secret of transparent aluminum in Star Trek IV: The Voyage Home, the pocketwatch in Somewhere in Time, and the main character in Time Rider. This does not happen under parallel or divergent dimension theories, because the traveler is not in his own universe. In Star Trek, Mr. Scott trades a metallurgical formula for a sheet of plexiglass. In a passing explanation, Scotty says, "How do we know he didn't invent the thing?" However, this means that in this timeline no one discovered transparent aluminum; the knowledge was passed from future to past, and it simply was. Dr Nichols is credited for it, but was given the formula. Under fixed time, this is a logical possibility, that it was neither invented nor discovered but the knowledge passed from future to past. The process of discovery is not necessary. This is the uncaused cause for which this theory is criticized, a simple predestination paradox. Under replacment theory, Dr. Nichols will be the one history credits, the original discovery being erased from time. In the original history, John Doe discovered this, and Scott learned the process years later; he introduces Nichols to the theory, and Nichols beats Doe to the patent office. This will impact things in the past, including the distribution of wealth, but as long as Scott is born, becomes an engineer, and travels to the past, he will have the knowledge to give to Nichols, and so the resolved final history of the N-jump has Scott getting the information from Nichols and returning it to him. The watch is more difficult. We first see elderly Elise McKenna give it to young Richard Collier, who takes it to the past and leaves it with young McKenna, who later gives it to Collier when she is old. Again we have an object with no origin in time. Again fixed time theory claims this is acceptable, and replacement theory puts the origin of the watch in the lost original history. But unlike the information passed from Scott to Nichols, the watch ages. When McKenna hands it to Collier, she has owned it for sixty years; he then owns it for a decade before giving it back to her. When she got it, then, it was at least seventy years old--but when he got it, it must have been 130, and thus 140 when he gave it to her, increasing seventy years with each pass. Fixed time expositions ignore this aging factor; the watch does not age, because if it is there it must be there. Replacement theory, though, recognizes the deterioration of the watch as fatal to time. Eventually the watch will decay to dust, McKenna will have nothing to give Collier, and time must revert to the original history for a new version of the watch to be introduced, which McKenna gives to Collier, restarting the cycle. The most complicated example appears in Time Rider. Lyle Swan meets a woman in the past whom he impregnates, and she gives birth to his son who is his father. Lyle is his own grandfather. The deterioration of looping objects takes a distinct form in this case; it can best be seen in the replacement theory resolution. There must have been an original Stranger who met and impregnated Grandmother, fathering Father. Father's DNA is 50% Stranger and 50% Grandmother. He marries Mother, siring Lyle, 50% Mother, 50% Father--which is 25% Stranger, 25% Grandmother. Lyle then disrupts the meeting between Grandmother and Stranger, fathering Father. Father's DNA is now 62.5% Grandmother, 25% Mother, and 12.5% Stranger. Lyle's becomes 62.5% Mother, 31.25% Grandmother, and only 6.25% Stranger. But Stranger is the only contributer of a Y chromosome here, so as his percentage falls to 3.125% of Father and 1.5625% of Lyle, and then <1% of Father and <0.5% of Lyle, eventually one of them will become a woman, and the chain will break. Stranger returns, and the cycle restarts, a cycling causality, a sawtooth snap with an infinity loop termination. Fixed time glosses the genetic problem; if Lyle is his own ancestor, it happened. Theorists who disallow predestination paradoxes avoid this problem, on the same basis as they do other paradoxes: it did not happen so it will not happen. What Happens If I Kill My Grandfather Before He Has Children? This is the second temporal anomaly sometimes known as a Grandfather Paradox. This is the paradox in which the time traveler intentionally or unintentionally destroys a link in his own chain of ancestry. It is interesting that the problem is always phrased with a grandfather. Rarely does anyone speak of traveling to the past to kill himself, even though that is the practical outcome of the scenario. This, though, permits fixed time theorists many options in explaining how it is that your efforts did not result in your own undoing. They would assert first that we know you failed, because had you succeeded you would never have been born to make the attempt. If pressed--how could you fail if you detonated a nuclear device under his bed while he was in it?--it shifts to whether you killed the right person. In one way or another, they insist that you cannot kill your true grandfather because history is fixed, and your birth demonstrates that your true grandfather lived to sire your father. This answer is entirely unsatisfactory for some theorists, who cannot understand how the concerted efforts of untold numbers of time travelers to undo their own lives the easy way could be thwarted by nature, as if it were ommiscient (because it can always predict paradox) and omnipotent (because it can always prevent it). The fixed time theorist, though, relies on the determinism inherent in that theory, that everything that ever has or ever will happen is already established, and thus whether we travel to the past or stay where we are we cannot really change anything. For the replacement theory, this is a classic infinity loop scenario: if the time traveler succeeds in killing his grandfather, he himself will never be born; if he is never born, he will never kill his grandfather; if he never kills his grandfather, he will be born; if he is born, he will kill his grandfather. While it is hoped that someone attempting to kill his grandfather would fail (which can resolve to an N-jump and the continuation of time), the possibility exists that a free-willed time traveler could succeed in destroying himself and taking the universe with him. Objections are raised to the infinity loop, and theorists have explored ways to avoid one, but under strict forms of replacement theory it is the unavoidable consequence of the broken causal chain. Similar broken causal chains occur in many time travel stories. In Back to the Future the core of the story revolves around the fact that by interfering with his parents' original meeting Marty McFly may have undone his own existence (which would ultimately undo his own interference). Millennium focuses on the constant danger the time travelers face of destroying their own world. What Is a Temporal Duplicate or Doppelganger? If you were to travel to the past, there would be the possibility that you might meet yourself, your former self, in the past; it might also happen that were you to travel to the future you might meet your future self. Further, you might find that the self you meet is not you--that is, that this meeting never happened for the older version of you when he was the younger version. Such other selves are called temporal duplicates or doppelgangers, and are another form of temporal anomaly which occurs in time travel. Under fixed time theory, the resolution of such an anomaly is relatively simple: if the meeting occurs, it will have occurred for all versions of the traveler. If you did not meet your older self when you were younger, you will not meet your younger self when you are older. It is not something to be avoided; it is something that cannot be caused to happen. Parallel and divergent dimension theories also treat the matter simply: you exist in each such universe, and if your other self has not also left for yet another universe you might meet him and change his life significantly, but since he is not really you, this does not matter except in that you are demonstrably an alien visitor to this universe. It is under replacement theory that temporal duplicates become an issue. Under this theory, there must be an original history of the world in which the time traveler did not meet himself; then the time traveler moves to the past and can meet his younger self, even though he did not when younger meet his older self. This will change his history. His younger self must then (to prevent an infinity loop) make the same trip when he is older to meet in turn his younger self, but because having met himself has changed him and he may remember the meeting, this event might be different from what he remembers. Again the younger self must make the same trip in turn. As long as each time traveler eventually makes the same trip as the original, there is a high probability that the sawtooth snap will resolve to an N-jump, and time will continue. In the final version of time, the time traveler will have played both roles in the meeting, but the "two" meetings will have been identical. The problem is less complicated with temporally duplicated objects, but that again the "younger" of the two objects must in its turn make the same trip made by the "older" object. This means that temporally duplicated objects (or people) can exist only from the moment of the arrival of the older to the moment of the departure of the younger. The problem is similar with travel to the future, but with an extra wrinkle. If a traveler goes to the future, in the original history he will find that he vanished from the universe at his point of departure and was never seen again; if he then returns to the past, he restores himself to the timeline, such that it is possible for his younger self coming forward to encounter him as his older self. This again alters the younger self, who must now return and become the older self for the younger self to meet, again with the hope that time may eventually stabilize such that "both" meetings are identical for the one traveler who experiences the meeting twice. Ultimately it is travel to the past that creates the duplicate, as the traveler backtracks on his own history; it is experienced differently if it begins with a leap to the future. In simple terms, Niven suggests that if it is possible to change the past by sending information to the past, eventually the past will be altered to an ideal state and no one will have any reason to change it further, and thus the ability to send information to the past will never be developed, there being no need for it. For example, if it were determined that the world of the future would be better if Ford had put an electric car into mass production in 2008, those in the future would send that information to 2008, and Ford would put the car into production; this would then change the future such that there would be no need for anyone to send that message to 2008, and the message which was received would never be sent, the world being the better version created by the delivery of that information. Two challenges may be raised against Niven's Law, one entirely theoretical the other entirely practical. The theoretical problem is related to causal chains. Niven's Law would seem to work in a divergent dimension theory universe, in that each sending of information to the past would create a universe in which that information was received; but in a fixed time theory world it does not apply at all (you cannot change the past), and in a replacement theory world there is a serious question as to whether an effect in the past can be maintained if it undoes its own cause in the future--the problem of killing your own grandfather, in that the cause in the future of the change in the past has been undone. The theoretical problem in relation to divergent dimension theory is that the changes to the past will always have been made in a different universe. The inventors of the time machine will never see it function, as the changes they make are actually made in someone else's past. In such universes, it is extremely difficult to demonstrate that any time machine works. The practical problem lies in the notion that humanity in the future will be in complete agreement concerning what the best past would have been. There will always be some who believe that the world would have been better had Kennedy (or perhaps Lincoln) not been assassinated, and so might attempt to alter that event; however, as the Red Dwarf episode Tikka to Ride humorously demonstrates, not everyone will agree that such a world would have been better, and someone might well attempt to restore the original history or something like it. Bill and Ted's Bogus Journey similarly shows that while Rufus might think the legacy of the band has left a future paradise, De Nomolos hopes to replace it with something more to his liking. Thus even if it is proposed that undoing a future cause does not undo a past effect (that you can kill your own grandfather) it does not follow that the world would ever reach a state which everyone agreed was the best possible history. Niven's Law is thus probably incorrect. It is often suggested that the simple solution to time travel problems is that the traveler creates an alternate dimension, leaving the original universe unchanged but having the new one diverge from its history at the point of arrival. This appears to have been the logic of Back to the Future 2, where Doc explains it; some suggest that this is the solution to the problems in Primer. In some versions this newly-created universe branches from the original there; in others it has independent existence to the beginning of time (or the eternal past, whichever solution we prefer to Kant's paradox). There is, however, a problem with the theory which is seen in the shifting expectations of those who hold it: what happens if the same traveler makes the same trip to the same point in the past? Let us assume that Joe leaves from 2010 and arrives in 2000, where to avoid confusion he gives his name as Moe. He interferes with the 2000 Presidential election in Florida, resulting in an Al Gore victory (the reverse of what happened in Bender's Big Score). Moe undoubtedly knows that he has effected this change; but Joe, his counterpart in this dimension, has no way of knowing either that Bush would have won or that he is responsible for the change. It is generally agreed that Joe does not have to travel from 2010 to 2000 under this theory, because Moe is already there. The chief complication at this point is that there are two of him, Moe ten years older than Joe. The changes Moe made are made, and Joe's failure to act will not change that. The complication is, what happens if Joe also leaves from 2010 to 2000? The first and obvious part of the answer is that he also creates a new dimension, in which he arrives. However, from there it becomes complicated. What is the present history of this new universe? At this point, we must consider why Joe made the trip. Here are some possibilities. Joe had reason to believe that Bush would have won had someone not tampered with the Florida elections, so he traveled back to prevent that. He expects to find Moe (whom he does not know is himself). Certainly if he arrives a moment after Moe does, he would arrive in his own history and Moe would be there. Yet if Moe's acts in history are not dependent on Joe's arrival, then even if Joe arrives before Moe, Moe should arrive, because Moe's arrival is part of Joe's history, and thus a fact in the past of the dimension from which this dimension diverges. Joe had reason to believe that he was Moe, and thinks that either replacement theory or fixed time theory holds that he must make this trip and do what he already did. He does not expect to find Moe, because he suspects that he is Moe, and indeed upon his arrival he finds that he is Moe, and so does what Moe did. The complication is that afficionados of divergent dimension theory will use whichever of those results fits the story. That is, if Joe expects to face Moe, he discovers that Moe is a parallel version of himself, and if Joe does not expect Moe to be there Moe is not. The logical objection is that it cannot be both ways, or rather, it cannot be whichever way we wish. Once Moe has reached the past, his counterpart Joe cannot travel to any universe in which Moe did not or does not arrive on schedule. Whatever process somehow duplicates the entire universe and all events within it must also duplicate that arrival. Thus if Moe prevents Joe from departing, there will be two of him of different ages in that universe; but if he does not prevent Joe from departing, the next universe will have three of him, two of whom have traveled from the future, and with each additional departure there is an additional arrival in the past, each of whom comes from a slightly different version of history. Thus although divergent dimension theory resolves many issues in stories in which the traveler does not again return to the past, it only complicates stories in which the same traveler makes the same trip, or in which the traveler attempts to "return" to his life in the new universe, occupied by his divergent self. In discussions about time travel theory mention is often made of the butterfly effect. There is a movie named for it (obviously, The Butterfly Effect), and it is referenced in other films. It is technically not part of time travel theory, but part of chaos theory, from the event which launched the concept. It surprisingly has nothing to do with a time traveler killing a prehistoric butterfly as happened in Bradbury's A Sound of Thunder--a story which predates the introduction of the theory by eight years--but instead traces to the work of meteorologist Edward Lorenz. In 1960, Lorenz was working with a program in twelve equations which modeled weather. His program ran to six decimal places; but in wanting to repeat a segment of it from the middle, he re-entered the data to three decimal places. The results were so completely different that he had to investigate the reason. Prior to this, values beyond the third decimal place were considered insignificant--no one could measure to that level of accuracy, and everyone assumed that fractions smaller than that were of no consequence. Yet the very slight rounding that had occurred by dropping those digits changed everything. The point was not lost on the scientist: very tiny incremental differences in the values of data accumulate to huge differences in results. Eventually someone (possibly Ian Stewart) suggested the illustration that the movement of the wings of a single butterfly would disrupt atmospheric conditions sufficiently to make the difference between the existence or non-existence of a tornado elsewhere in the world a month later. It should be understood that chaos theory does not claim that anything which happens is random; it retains the foundation in physics that all effects are the consequential results of causes, that everything which happens is part of causal chains. Where it breaks is in asserting that for much of reality we cannot know all the factors involved in the causal chains. We know that if we hit the cue ball precisely right, it will transfer its energy in a predictable way to the ball it strikes, sending that ball on a predictable course, in theory. We cannot account, though, for imperfections in the surface of the table, changes in the air currents of the room, vibrations coming from the floor, slippage of the tip of the cue against the ball or interference of residual chalk to the impact--all of which can alter the outcome. In so closed a system as the pool table, those variables ordinarily do not matter (barring, for example, an earthquake or sudden gale); in an open system such as the world, they become critical. This matters to time travel because, barring fixed time theory, a time traveler cannot avoid changing the past--he absorbs or reflects photons, alters temperatures and air currents, introduces vibrations, and even with the best precautions (as in A Sound of Thunder) makes at least some miniscule changes to the past. Those miniscule changes are in theory amplified--much as the genetic problem discussed in connection with Timeline, each change cascades into more changes until the probability of not altering something critical becomes negligible. This becomes particularly problematic for replacement theory: if indeed the presence of a time traveler in the past has an effect amplified over time, the fact that he ate the particular hamburger someone else would have eaten or took a breath of air creating an altered airflow or simply stood in one place changing airflow and mass for a moment, could have unforseeable consequences of devastating proportions; and the further into the past the change is initiated, the greater the potential degree of change in the future. Replacement theory analyses generally ignore this factor: not every flap of a butterly's wing creates or prevents a tornado, and an analysis can only cover what would happen based on the known causal chains, not what might happen from the changes no one could have noticed. Yet as the sword of Damocles it hangs above every trip into history, with the certainty that something will be different in the future that could not have been predicted. What Is the Novikov Self-consistency Principle? Igor Dmitriyevich Novikov has contributed to the theory of time travel with what is called the self-consistency principle, or sometimes the self-consistency conjecture. In its simplest form, it says in essence that time travel is only possible if it does not cause a paradox. In that sense, it is a restatement of fixed time theory, in which somehow the universe knows what actions in the past will cause a paradox and chooses to prevent such actions. What makes Novikov significant, though, is that he is a physicist and has worked through a mathematical solution to problems in time travel under relativity, in which time travel is possible under these conditions. That does not mean that the principle has been proved. It only means that there is a possible mathematical model for the universe in which time travel is possible given this principle. There are other known solutions to the equations which do not allow time travel, and it is assumed that additional solutions exist. However, given the billiard ball example, in which a billiard ball coming out of a wormhole from the future knocks itself into the wormhole in the future, it is asserted that there are always many possible trajectories for this, and therefore it must be that it follows one of those trajectories. What is unclear is what mechanism prevents an outcome that does not fit the theory: given that I cannot travel to the past to kill my own grandfather, why not? Apart from that it would cause a paradox (as the chief morlock asserts in the remake of The Time Machine), what prevents a time traveler from changing the past? It is simple enough to devise a time travel task that would be unresolvable and yet not difficult to perform. Novikov asserts that because a paradox is mathematically anomalous it cannot happen. Yet the point of a temporal paradox up front is that it appears to be impossible--the predestination paradox his theory permits not less so than the grandfather paradox it excludes. That what appears logically impossible on its face should also prove mathematically impossible under a certain model of the universe is not at all surprising. It may do more to call into question the model itself than to tell us anything about the universe. Thus in the end, Novikov has said that if time is unalterable, it cannot be altered. The question is whether the premise is correct.